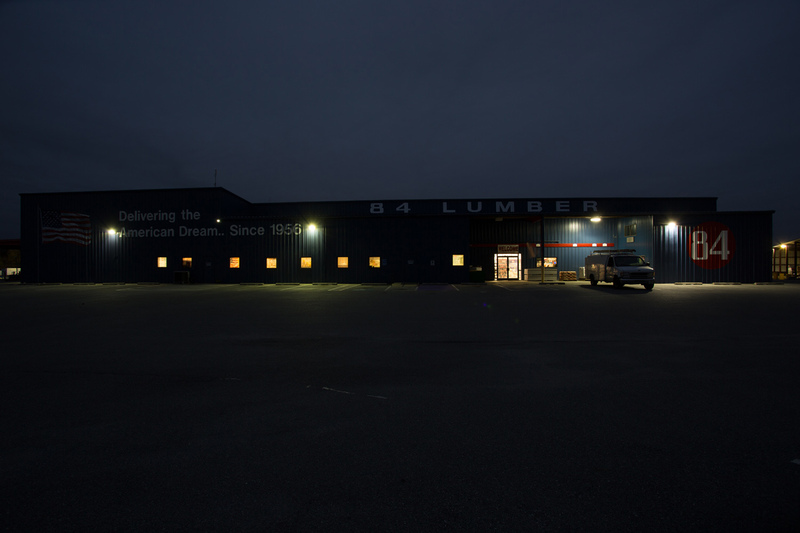 Coming as I do from western Pennsylvania, almost everyone there who ever built anything out of wood is aware of 84 Lumber and the fact that the company takes its name from its birthplace in the town of Eighty Four, Pennsylvania. 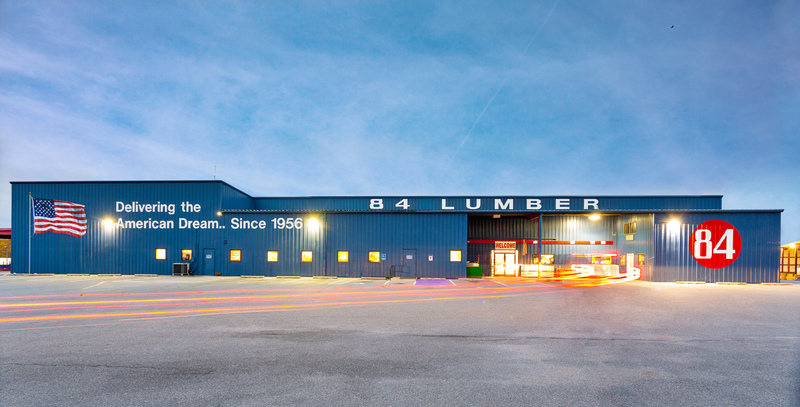 As a result, it was no surprise to me to find an 84 Lumber in Mt Airy, in western Maryland. They’ve always seemed to just be everywhere, so why not Maryland, too? In late October of 2016 I got a call from Kristen Russell at their Eighty Four, PA., world headquarters, asking if I could create a quality photo of the Mt Airy operation worthy of inclusion in their 2017 corporate calendar. I welcomed the opportunity. Since it was a short 3-day deadline, plus the fact that the orientation of the building suggested dawn as the best time, plus the forecast of rainy weather arriving in 2 days, I started immediately. We do everything possible for clients. Jeff Behm Photography does everything possible for clients. First, the Mt. Airy store was called and told that I’d be scouting the location at dawn the next morning. 84 opens very early for the convenience of their contractors, who necessarily start their days early, too. I didn’t want to alarm anybody as to who was wandering around outside taking pictures in the pre-dawn dark. Even though I took cameras and tripod with me on the location scout, no photos were taken other than for reference and planning. It was very gray, and seeing it was Oct. 31, it wasn’t light until quite a bit later than I could spare that first day. Of course, that made for better scheduling of the following day’s principal photography. I also met with the assistant manager on the 31st, who walked around with me as we discussed possible changes for the best presentation of their storefront. They did an excellent job in this preparation, as you can see. After returning to my office from scouting, I was nervous about the continuously changing weather forecast, which had begun to predict gray skies for Nov 1, the day of photography. Hedging on the weather, I went to a nearby parking lot that provided an unobstructed view of the sky while it was still very early, and photographed the blue, partly cloudy sky in several different directions, just in case. The next day, Nov. 1st, I arrived at 6:45 AM, still full dark, but necessary in order to set up and be fully ready when it became light enough. The photo below was taken at 7:10 AM as a test. You can see that the first contractor is already there, picking up materials for his day’s work. By 7:30 AM, real photography began and continued until I had the angles and exposures needed to complete the assignment – one straight on, one from the left, and one from the right. Of course, that entailed a series of exposure brackets from many different angles. While photographing the straight on view, the contractor from the photo (above) started his truck and lights and pulled out (first photograph). I was using a very long exposure time to allow for greater depth of field and to compensate for the still low light levels. As you can see, the lights of the truck created an interesting trail across the storefront. I was undecided as to whether to show Ms. Russell that photo, having several completely clean versions of the same perspective. But on the off chance that they might find it interesting, I did show it, and Hooray!, it was one of the three they selected. 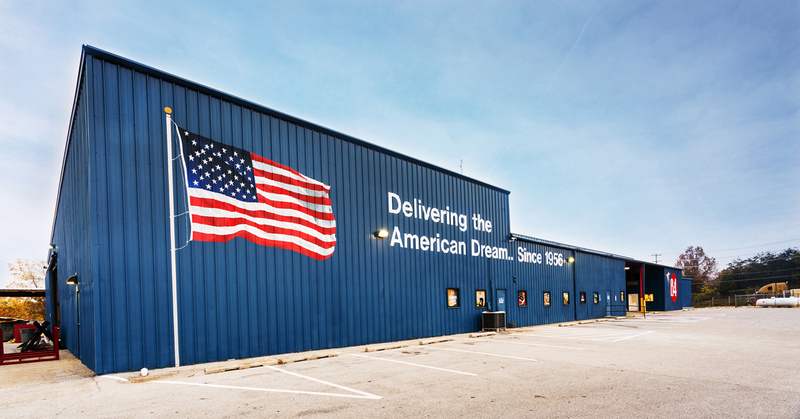 One very important instruction given was to get a great shot of the American Flag painted on the left front of the building. This is actually my favorite from this assignment, although I like them all, for different reasons. They presented a challenge on many levels : timing, aesthetics, weather and creation of interesting views, to name a few. Oh, and yes, I needed the skies shot the previous day. The weather system arrived sooner than expected (hey, it’s Maryland, folks) leaving us with gray skies at dawn on Nov 1 and for an hour or two after. Jeff Behm Photography is a professional photography service, with commercial and advertising experience covering most of the United States, much of Canada and western Europe. Your photographic needs are as important to us as they are to you. Call 724-730-8513 for a discussion of your needs.